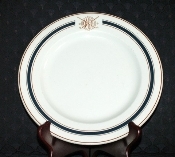 These classic luncheon plates bearing the lcrest of the Washington Golf and Country Club were manufactured by the Walker China Company of Bedford Ohio. Each of the available Walker China Washington Golf & Country Club Luncheon Plates is in Excellent condition with no chips, cracks, and few, if any utensil marks. The colors vibrant, graphic is clear and sharp. The Walker China Washington Golf & Country Club Luncheon Plates measure 9-3/4 inches in diameter. The back of the Walker China Washington Golf & Country Club Luncheon Plates is marked with; "Walker China, Vitrified, Bedford, Ohio".